Wiang Kum Kam is an ancient city located in Saraphi District, Chiang Mai. It was built by King Mangrai around the latter part of the 13th century. The city was established as a new capital. Wiang Kum Kam was the capital of the Lanna empire for a period of only 10 years. Because the town regularly flooded, Mengrai decided to move the capital to his newly founded city Chiang Mai in 1296. Wiang Kum Kam remained an important town in the Lanna Kingdom until the 16th century, when the Ping river changed its course. After flooding largely buried Wiang Kum Kam under mud and silt, the town was abandoned. This prosperity continued until a significant change occurred when the Ping River changed its course at a point where it flowed from the north to the west very near to Wiang Kum Kam. However, according to the evidence recovered from the soil layers of Wiang Kum Kam by the Fine Arts Department, it is clear that the destruction and abandonment of Wiang Kum Kam was not initially caused by floods. Rather, it was primarily caused by the upheaval of war, which occurred as Myanmar sought to acquire Chiang Mai and Lanna. Myanmar forcibly relocate the people of Wiang Kum Kam as slave labor. The city was left uninhabited. Gradually, the city was transformed into a forested area. Subsequently, the continuous floods and currents of the Ping River eventually covered the precinct of Wiang Kum Kam with 1-2 meters of sediment. For the next 250 years, these two cities coexisted peacefully under Lanna and Burmese reigns. Then, at some point between 1558-1594, the Ping River changed his directions and Wiang Kum Kam was buried under a rooftop of mud and sludge. Excavations of Wiang Kum Kam started in the 1980’s. The site was cleared of overgrowth and a number of monuments was partly restored by the Thai Fine Arts Department. The ancient town measures 850 meters long and 600 meters wide. Over an area of several square kilometers inside and outside the town the remains of several dozens ancient monuments have been discovered until now. Traces of the ancient walls and moats are still remain. The survey found that there are over 40 sites of the ancient remains in the area of Wiang Kum Kam. Some are the ancient Buddhist temples and some are the ancient Buddha image. The important one are Chedi Liam Temple, Chang Kham Temple, the pagoda of Kum Kam Temple, Noi Temple, Pu Pia Temple, Pra That Khao Temple and E-Kang Temple. The art and architecture are varied and mixed between the old and the modern form of ancient Lanna. Today, you can explore its partially reconstructed temples, courtyards, homes, and brick remains; a mere 10 minutes from downtown Chiang Mai, Thailand. Surrounded by paddy and village houses, the extensive site has a pleasant rural feel, yet it is very close to Chiang Mai. The whole site of Wiang Kum Kam is too large to explore on foot. The best way to get around is to hire a local guide with a pony carriage, open-air tram or bicycle. Visiting Wiang Kum Kam Information Center first is recommended. At the information center, you will see the importance and history of Wiang Kum Kam, details of the discoveries and exhibitions. 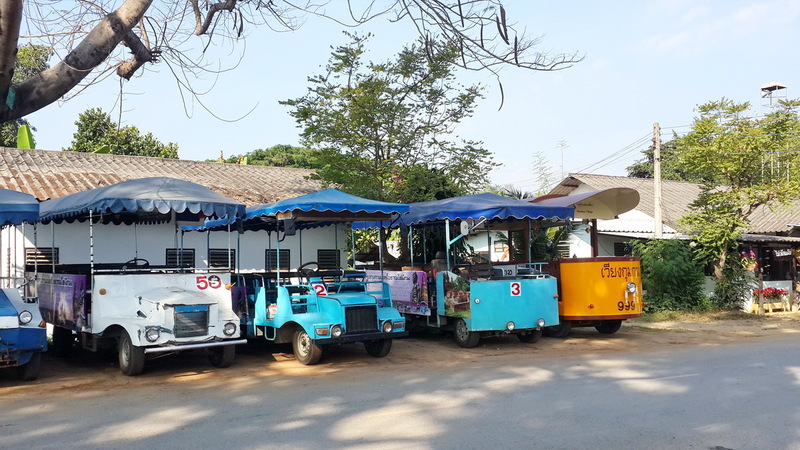 At the information center you can also rent bicycles (20 THB) or take a look at the Wiang Kum Kam Museum (10 THB). You can make a tour with a horse carriage (200 THB per carriage per tour) or with a tram (20 seats, 1-5 persons 250 THB, 6-10 persons 300 THB, 11-15 persons 350 THB, 16-20 persons 400 THB per tram per tour). The main feature of interest is the Haripunchai style chedi built around 1286. It is a square stepped chedi with Buddha images in niches at each level. 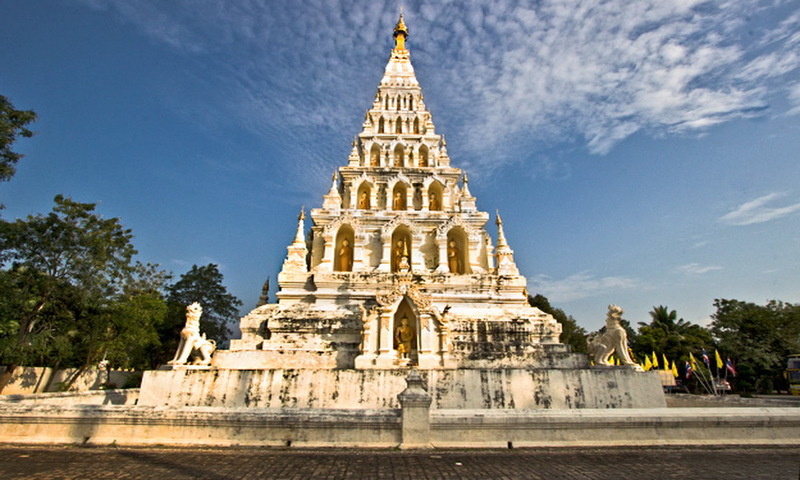 The chedi is a replica of the Mahapol Chedi at Wat Chamadevi in Lamphun. The temple got the name Wat Phra Chao Ong Dam (pra jou ong dum), which means in northern dialekt “Temple of the Black Buddha Image”, from a burned bronze Buddha image found there. The other name, Phaya Mangrai, given by locals, refers to the king who established Wiang Kum Kam. The Wat That Khao or the “temple of the white chedi” was named after its brick chedi that was originally covered with a layer of lime. The temple, believed to have been built during the 16th century was excavated and partly restored in 1985 – 1986. It consists of a viharn, a chedi and a pavilion. The high base, lower parts of two rows of pillars and a stairway remains of the viharn. The brick chedi behind it has collapsed. Next to the chedi are the remains of a pavilion enshrining a large image of the Buddha in meditation posture. The image is a replacement; some remnants of the original brick image coated with lime have been found during the excavation works. 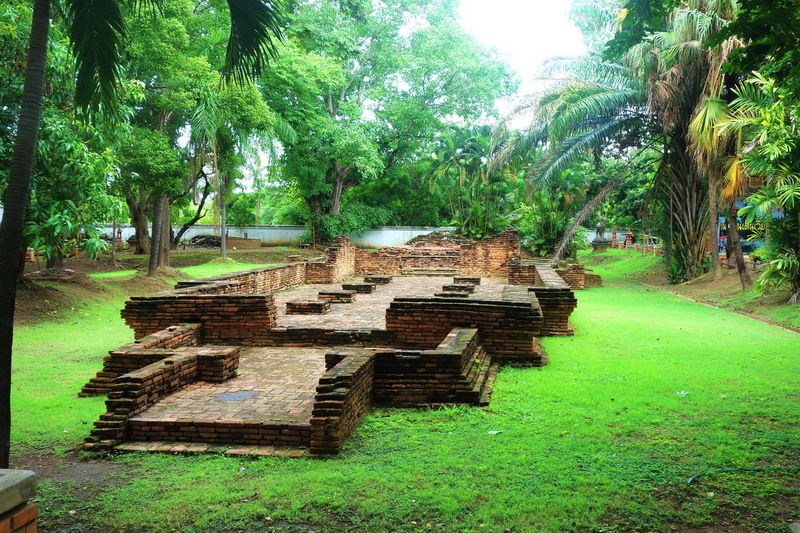 Wat Pu Pia was excavated and partly restored by the Thai Fine Arts Department in 1985 and 1986. It comprises of a viharn, a chedi and a pavilion used to perform Buddhist ceremonies. Best preserved is the brick chedi, which is in a very good condition. Niches on each of its four sides enshrine images of the Buddha. Very intricate stuccoed ornamentations remain on the arches over the niches. Wat E-Kang is believed to have been built in the 16th century. The temple’s original name is unknown. Local people named the temple after the monkeys called “kang” in Northern Thai, that used to live in the area. The temple was excavated by the Thai Fine Arts Department in 1985. It comprises of a chedi and a viharn, both sharing the same base. The well preserved brick chedi sits on a square base. On top of that are three receding octagonal tiers, a center section with indented corners and a bell shaped stupa. Little more than the base and lower part of the pillars remains of the viharn. Wat Nan Chang (narn charng) is an evidence for flooding in the past at Wiang Kum Kam. The 1.80 meters deep layers of sand and soil sediments were excavated in 2002 to 2003. 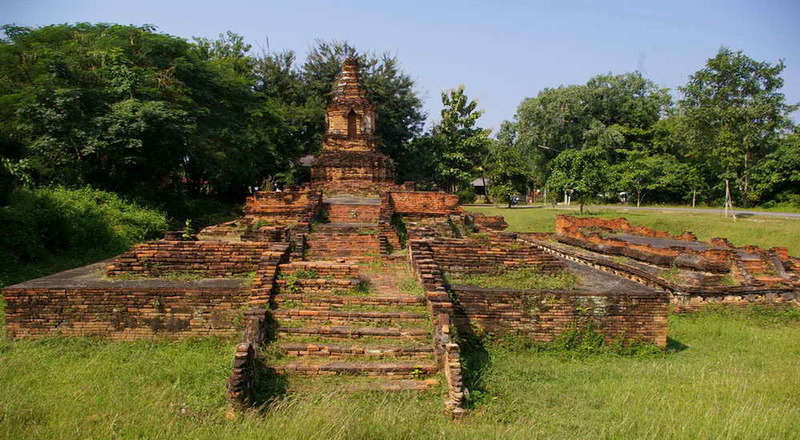 Revealed were ruins of buildings similar to other temples in Wiang Kum Kam. Yet this temple is different in that there were 2 buildings of 2 periods on top of each other. This temple is called Wat Nan Chang to honour the ancesters of the owner of the land. One interesting thing about this temple is that it faces north while other temples face east. It is speculated that it was built to face the now dried up Ping River, which was a transportation / travel route of the time. Apart from the Makara at the stairway, other beautiful stucco works found include designs of mythical creatures such as Kilen (a Chinese mixed creature of dragon, deer, cow and horse), Haemaraja (a mixed creature of lion and swan) and Singha (lion-like beasts). Those were found under the middle of the pedestal base of the main Buddha image inthe viharn. Wat Chang Kam (Wat Kan Tom) was built in 1290 by order of King Mengrai. That Wat Chang Kam, which translates to “temple carried by elephants” derives its name from its bell shaped chedi with the bodies of elephants protruding out of the base that seem to carry the chedi on their backs, a style similar to the elephant encircled chedis of the Sukhothai Historical Park. The large white chedi enshrining images of the Buddha in its niches is topped with a golden spire. Other structures on the grounds include an elegant recent Lanna style viharn with a multi tiered roof and a spirit house in which the spirit of King Mengrai is believed to live. Wiang Kum Kam is located 5 km south of the city of Chiang Mai, can be accessed by Route 106 (the Chiang Mai – Lamphun road) near the Ping River. For more information or to reserve a tour call +66 (0) 5327 7322. You can visit Wiang Kum Kam between 08:30 a.m. – 05:00 p.m.